How Many Calories Do You Burn When You Swim the Breaststroke for One Hour? Diving into the pool and using the breaststroke to power your body through the water is more than just a way to beat the heat in July. This exercise not only burns calories quickly, but also can increase your endurance, build your muscles, strengthen your heart and provide stress relief. If your main workout goal is to lose weight, the breaststroke can be a vital tool in your fitness arsenal. Always consult your doctor, though, before beginning this or any exercise regimen. Your weight helps dictate the role at which you'll burn calories during any activity, including swimming the breaststroke. According to Harvard Health Publications, a person who weighs 125 pounds burns about 600 calories during 60 minutes of swimming the breaststroke. Someone who weighs 155 pounds burns about 744 calories during a swim of the same duration using the breaststroke. Harvard Health Publications notes the breaststroke isn't the fastest way to burn calories, but it's not the slowest, either. The backstroke burns calories slower than the breaststroke, while the front crawl and butterfly burn calories the quickest of any swimming stroke. 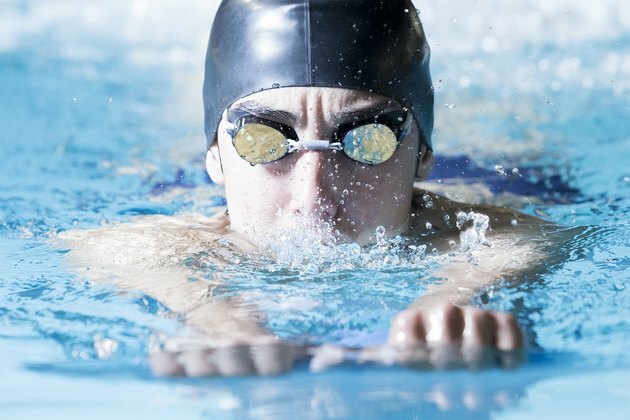 A person who weighs 125 pounds, notes Harvard, burns about 480 calories in an hour of swimming the backstroke and about 660 calories in an hour of swimming either the front crawl or butterfly. A 155-pound person burns about 596 calories swimming the backstroke for an hour and 818 calories swimming either the front crawl or butterfly.